A few nights ago, while cleaning up from a small family gathering I took a few sips of what was left in our teapot. This is not an extraordinary activity but our cups were dirty, and I was thirsty. So I drank the tea directly from the spout. My husband seemed a little surprised by this, but not terribly. It seems a bit uncouth to drink from the spout, but I pointed out that the earliest known teapots were actually made to be used this way. Tea was consumed long before teapots were invented. Before teapots, powdered tea was created by rolling the tea leaves by hand, drying, then grinding them into a powder. The powder was frothed in wide bowls (just as Matcha still is today). 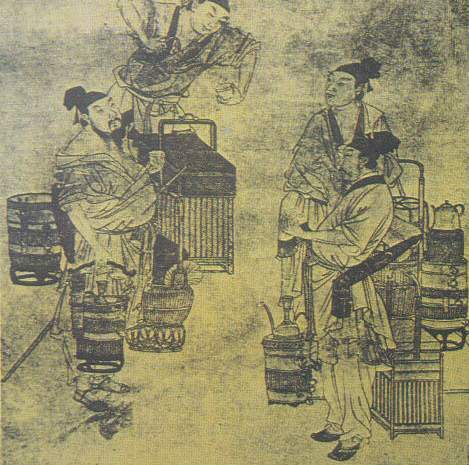 Infusing tea, similar to what most of us do today, became popular at the beginning of the Ming Dynasty (1368-1644) in China. The Chinese fashioned teapots out of purple 'zisha' clay. These are Yixing teapots, and were the first used for specifically brewing tea. Yixing pottery (not specifically teapots) dates back to the Sung Dynasty (960-1279). Yixing teapots are very special because they are quite porous and will take on the flavor of the tea you use. It is important to use just one type of tea for one pot. A detailed post on Yixing teapots will have to follow soon. I was searching online for pictures of early teapots, but they have been difficult to find! If I ever find myself in Hong Kong, there is a Museum of Tea Ware to visit. It supposedly has an example of one of the first teapots. Hopefully one of these days I will get there! My research results also varied a little bit with each source. So please have a look on your own if you are interested in the subject. I could probably go on and on about teapots. There are so many different types, styles, and ways to use them. I have a small collection of them myself, and it's difficult to limit a collection to a specific type. There is so much to learn about teapots. There are Chinese style, Japanese style, Russian Samovars, porcelain, clay, pewter, silver, new and antique, on and on and on. There are experts in just about every type of teapot, and the rituals they are used for. There is so much to learn about teapots and tea ceremonies, and I am nowhere near an expert in any of it. It is exciting that the scope of learning all things tea is practically limitless. There is always something new to discover. Information will continue to unfold as long as it is sought out. This is part of what makes enjoying tea so pleasurable.